Save on time while better guaranteeing a successful finish with pre-mixed paints. Our Paint By Number package comes with 10 bottles of colours for your mural requiring only minimal mixing to achieve your team's best result. 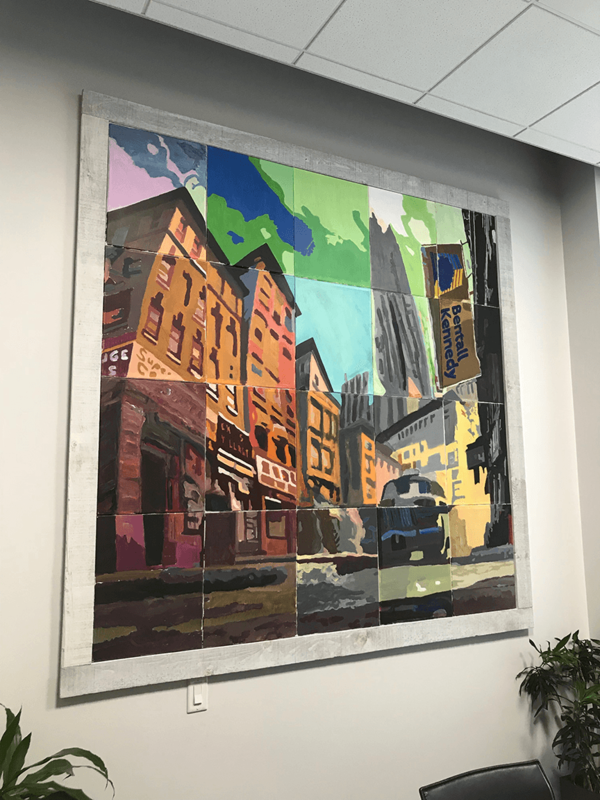 The effect of your new addition to the office is even more appreciated from a short distance away once the finished mural is mounted on the wall. Errant details fade in importance compared to the larger shapes and colours which predominate. Just like with work; take care of the big problems and the little problems take care of themselves! Your new addition to the office is best appreciated from a short distance away. Errant details fade in importance compared to the larger shapes and colours which predominate just a few feet back. Just like with work; take care of the big problems and the little problems take care of themselves! apron before picking up a brush. This was the BDC's third event with us. We had the pleasure of setting up an activity for approx. 70 people for 8 different murals. We were invited to set-up our portable art studio at one of Toronto's finest hotels. We'll treat your venue just as well! Sunlife Financial is our current record holder for largest group size! We use drop sheets to protect your carpets but for wood or otherwise smooth floors our water soluble acrylic paint is the guarantee that nothing will be left behind. With Loyalty One we went to their location and set up a Custom Mural event for 50. This was a Paint Party event at the Sheraton on Queen with Shire Pharmaceuticals we did. Pack up the painted mural and take it back to the office in these large rubber bins that are yours to keep. We travel around Toronto and set-up our portable art studio in hotels, offices, private facilities and conference centres. Our location on Adelaide West can accommodate up to 30 participants but we're available when and were you need us up to groups of 100.